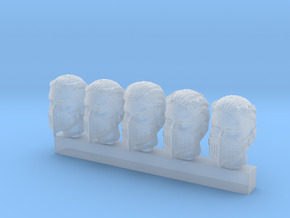 Set of 5 Heads to convert your miniatures to be Chem Sisters. 5 Female Heads with rebreather, goggles, and two-headed eagle symbol on the back of the head. Check carefully the measures, I have 3 different sizes of this kit on my shop.